Day 2 with our van and breakfast started well. We said goodbye to one flock of sheep and hello later to another, wondering which had donated their merino wool for our Icebreaker clothing which thankfully cut down in stinkiness and laundry at the same time. Smart wool indeed! 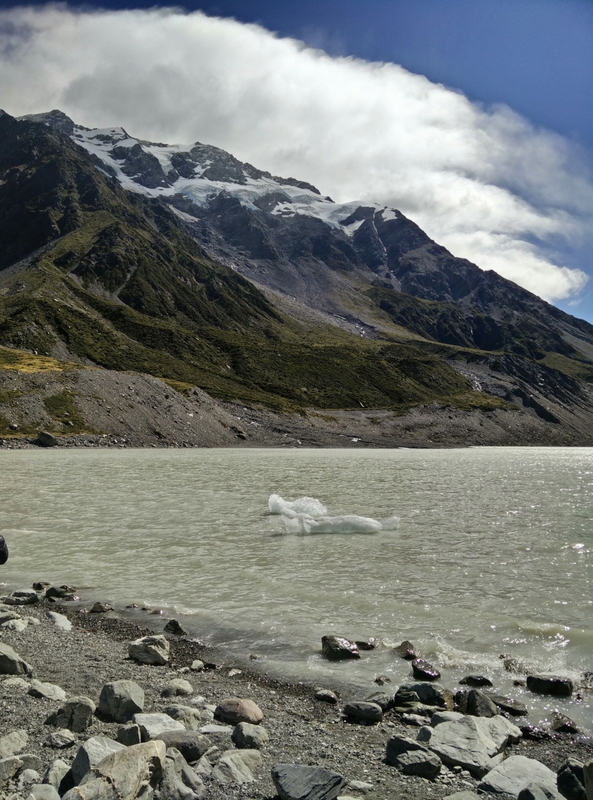 Then we feasted our eyes on Aoraki, who you may know as Mount Cook. This sacred spot to local Maori has its own creation story which goes something like this: the Sky father (named Raki) took as his bride the Earth mother. Raki’s four sons, including Cloud in the Sky (or Ao-raki) descended from the sky in a canoe to greet and explore. They were out at sea, and said an incantation to return home. Instead, the canoe flipped and turned to stone and the four brothers scrambled up, also turning to stone. Some say that like a king, Aoraki doesn’t always show itself, but rather hides in clouds. We had a lovely royal audience, including hikes over swing bridges. At night, we set up camp with the other van people at a lovely lake with a view of the mountains.